Started in 1979 in Kaohsiung trying to blend in Japanese Style Hotpot with non frozen beef which bring the freshness of the meat in Kaohsiung. Since then this hotpot joint took to another level. Not many tourist know about this area but it is always flock with the locals. 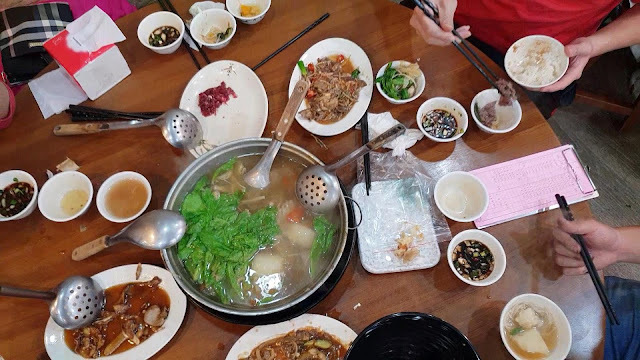 There are many versions of Hotpot in Kaohsiung or the whole of Taiwan. But this is one joint I felt in love couple of years back. *The beef are so fresh that is slaughtered in Tainan and delivery to Kaohsiung on the same day. *Their stir fry dishes are just as good. I never have such fresh beef, the sweetness and tenderness just blew my mind away. The longer you cooked in the hotpot, the taste just changes distinctively just like you have fresh prawn hotpot.... the sweetness with a beef flavour. The beef just melts in your mouth. Kaohsiung is not far from Tainan, so the beef is never frozen maybe chill. Tainan has the freshest Yellow Cow meat. I have tasted Tainan beef there but not the hotpot type. In Tainan, their fresh beef are poured our a hot broth and served with ginger. The shop is closed on Monday because Tainan forbid slaughter of cow on Monday. Have not found the reason why but will try. This hotpot is best you have a company of 3 or more so you can order more dishes. We have waited for a long time to have this meal and finally we got our staff of 4 to gather this flavoursome dish. We have been to this joint at least 6 times but most of the time just a couple you cannot enjoy much. This meal we ordered 4 stirred fry dishes plus the hot pot. It is best you book in advance and take note of their opening hours. Do not forget to order their Ox Tail. The stir fry I would recommend are, sesame oil kidney, fry livery and tendons. PS Bring a raw egg if you like the Japanese way of having beef.